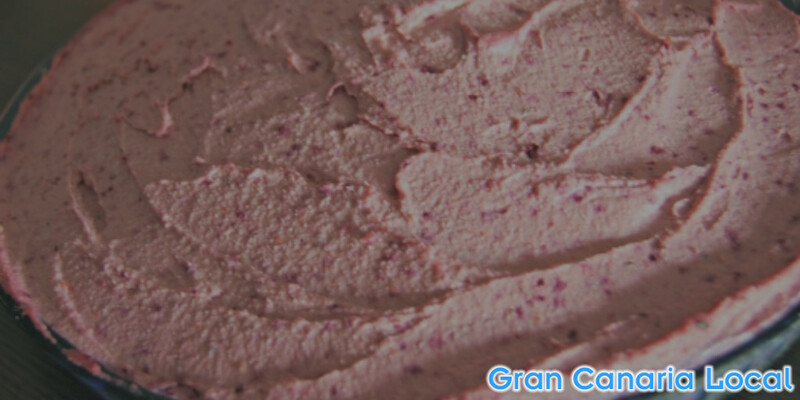 0.1 Vegan and about to visit Gran Canaria? We’ll show you how to avoid inadvertently adding animal protein or lactose to your diet. It’s as easy as 1, 2, 3. 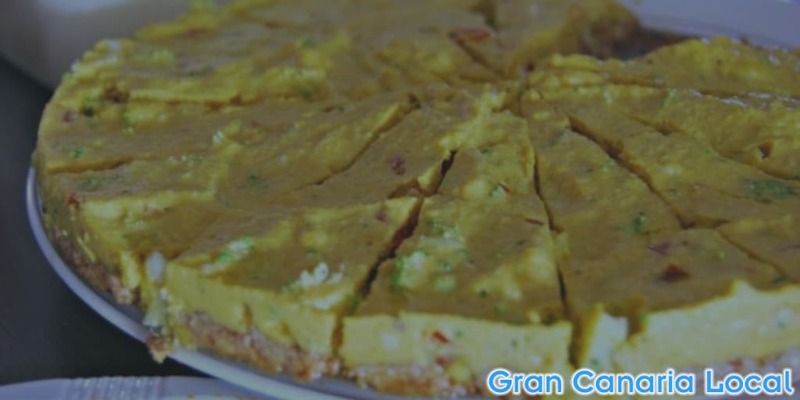 Vegan and about to visit Gran Canaria? We’ll show you how to avoid inadvertently adding animal protein or lactose to your diet. It’s as easy as 1, 2, 3. Mr GCL’s a former vegan and current vegetarian. So, he’s already met the challenges you’re about to face. And if you follow our top tips, you’ll be able to stick to your vegan diet rather than falter from your path. 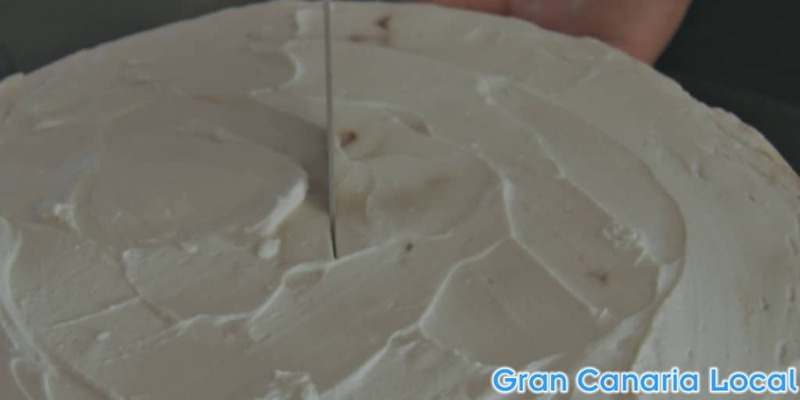 Are you planning on staying in self-catering holiday accommodation on a Gran Canaria holiday. Perhaps in one of our recommended rural retreats on GC? Or maybe you’re about to start a new life on our island? Whatever your situation, you’ll be able to find ingredients to prepare delicious vegan meals in your temporary/permanent kitchen. The markets are full of fresh fruit and vegetables which the locals love to buy. They even hold fiestas celebrating red onion in Gáldar and watercress in Firgas. 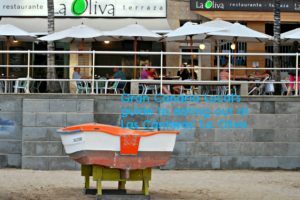 You’ll find healthfood shops around the island which are particularly handy for picking up meat substitutes such as soya and tofu, such as Tienda Ecológica Sabe a Gloria in Santa Brígida. There’s even an organic section nowadays in the HiperDino chain of supermarkets. Expect to pay extra as most of the products are imported, as they are in Las Palmas de Gran Canaria’s Indian minimarket Godhwani Hermanos e Hijos; from such exotic destinations as Southall. Go vegan was no. 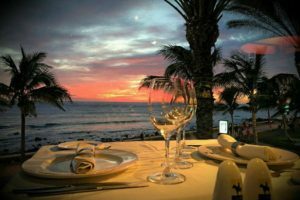 5 of our five tried and trusted techniques to survive as a vegetarian on Gran Canaria. However, the four other tips are just as relevant to total vegetarians as they are to lacto veggies. We’ve touched on going ethnic and going local, but you should also check out food to go as in delis as well as the latest restaurants to open. And it should go without saying/typing, but you’ll find more vegan dishes in a vegetarian restaurant than you will in a burger joint. 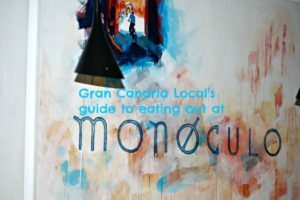 Since we lovingly put together our vegetarian guide to Gran Canaria, La Hierba de Luisa has opened in Las Palmas de Gran Canaria’s Vegueta. It’s easily one of the prime locations, situated, as it is, on the cobbled streets of the capital’s old town. 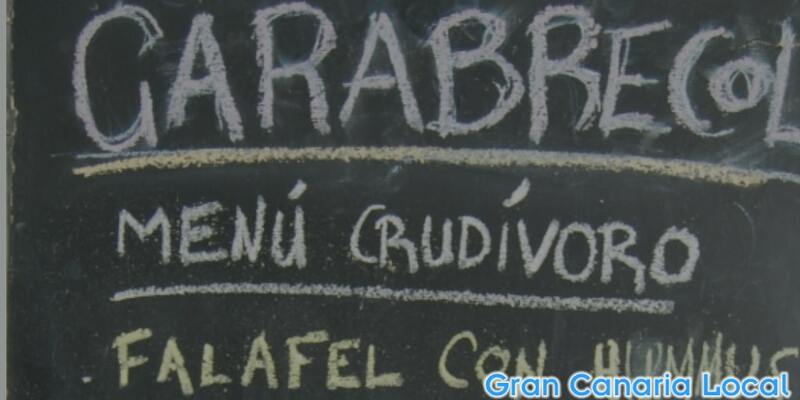 It was actually at La Hierba de Luisa that we first came across Carabrecol‘s noche de tapas veganas. 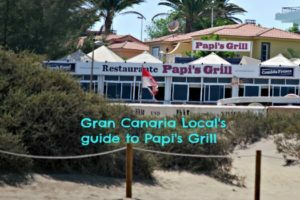 Mr Gran Canaria Local was out and about on his irregular post-football Tapas Thursday meet-up with friends aka the Ruta del Pincho. Carabrecol were victims of their own success that night as long queues and deplenishing supplies of food meant that Mr GCL and party left without sampling their vegan tapas. So, when we were invited to attend the 5a noche de tapas veganas y crudiveganas at El Rincón Aragonés; we made sure we turned up early. 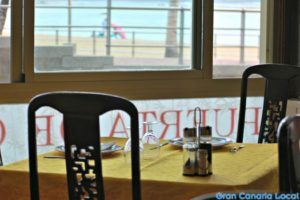 Located on Canteras seafront, towards the La Puntilla end, it’s an easy enough eatery to find. We arrived to discover the Carabrecol team had taken over the kitchen and speakers with loud rock music playing. Carabrecol were born out of frustration. A group of hacked-off vegan friends in Las Palmas de Gran Canaria christened themselves Broccoli Face. Bored by the same old options, they decided to start nights across the capital with less limited choices. With the exception of the Espagueti Boloñesa which we didn’t try, every tapa was raw. 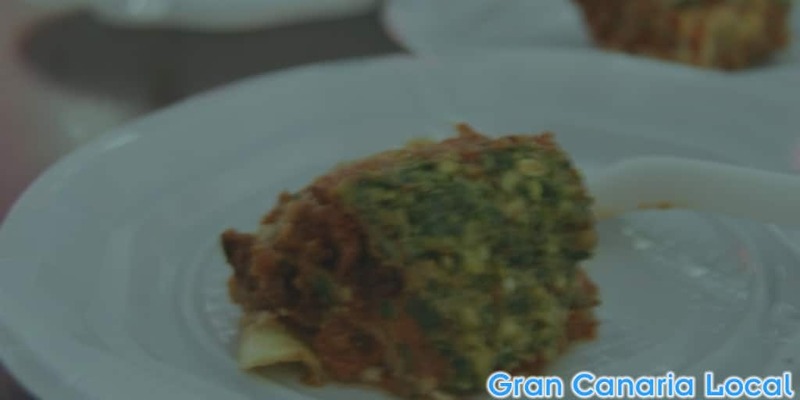 We liked the mustardy lasagne more than the quiche which tasted like a savoury cheesecake. 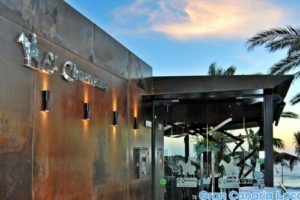 Unfortunately, we missed out on the actual desserts as we had to leave promptly to attend the opening of El Churrasco‘s Café Regina. Well, there’s always next time. Which will be at the end of the month at the 6th vegan tapas night. Same time, same place. Disclaimer: Mr Gran Canaria Local and friends paid in full for tapas reasonably priced at 1,5€ each. As we’ll do next time. And the time after that.